I saw this on Amy’s blog, Simply Sugar and Gluten Free, and thought, “I must make that soup!” Today. Even better that I had most of the ingredients on hand, so this was really impromptu. Things I did not have: dried rosemary, dried basil, parsley, milk, and cheese. The last two ingredients didn’t matter so much since I’m making a dairy-free version, substituting the milk with coconut milk. I used fresh cilantro in place of the parsley and ground rosemary instead of dried. Sheesh, this is sounding like a lot of deviation from the recipe, isn’t it? Mainly because, aside from making it dairy-free, I didn’t want to have to wait to buy the ingredients I did not have. I wanted to make it now, deciding to use what I already had on hand, in stock, and substitute where possible. Despite all, the soup turned out really well and everyone loved it. We had it for dinner. My version is not as thick as Amy’s. 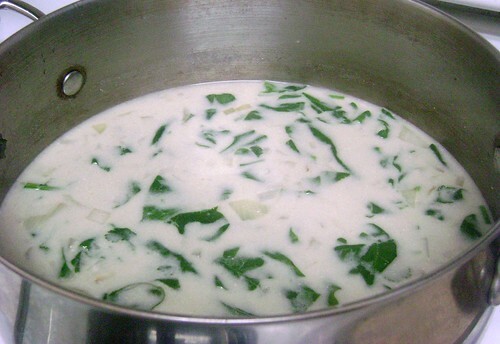 In fact, its flavour reminds me of something my Dad used to make with spinach and coconut milk that was made in the oven. So here it is: Amy’s Spinach Florentine Potato Soup, my way. I only hope that I don’t sound like Frank Sinatra (kidding). I’ll try getting more photos – possibly including prep – later. Taking pictures of your family’s dinner isn’t always easy. Heat olive or grapeseed oil over medium-low heat. Add onion and ground rosemary; onion should start sizzling immediately or almost immediately upon contact. Stir, mixing the onion and rosemary, and cover. Cook for 8 to 10 minutes, stirring ocassionally. Add stock or water, potatoes, and salt. Bring to a very gentle boil and lower to a simmer. Cover and cook for about 10 minutes or until potatoes are tender. Use a slotted spoon to remove about 2 cups of the potatoes. Transfer to a bowl or small pot and mash (Z note: Amy used a blender, but I sometimes prefer being more hands-on). Add the spinach and cilantro to the pot, cover and cook for a few minutes or until greens are tender but still bright in colour – not wilted. Stir the coconut milk into the mashed potatoes, adding some at a time so that it’s easier to manage, until completely mixed. Stir back into the pot and heat gently. Serve and enjoy! I bet the coconut milk and cilantro was fabulous…my mind is reeling…what about no rosemary and add curry powder? I could totally go for that. Amy, the curry sounds like a fantastic idea! Seeing as I’m going to be making this soup again tonight, I’ll try your suggestion and let you know how it worked out – maybe I’ll blog it. Thanks!